Levindale Hebrew Geriatric Center and Hospital is passionate about providing the best medical and emotional care for its residents and patients. Quality of life for the people who stay or work at Levindale is the top priority. Levindale was founded in 1890 as the Hebrew Friendly Inn. Later, it was renamed Levindale for Louis H. Levin, a former executive director of The Associated Jewish Charities. Levindale is an agency of The Associated: Jewish Community Federation of Baltimore. In 1996, Levindale united with Sinai Hospital to form the Sinai Health System. Then in 1998, Sinai Health merged with Northwest Hospital to become LifeBridge Health. This distinctive system, which now also includes Carroll Hospital, brings a full continuum of health care services to the community. Today, Levindale is a 330-licensed-bed facility. Levindale's geriatric center includes 126 comprehensive care (long-term care) beds, 35 subacute beds, 28 dementia care beds and a 21-bed respiratory care unit. The Specialty Hospital at Levindale consists of a 40-bed high intensity care unit and an 80-bed behavioral health unit. 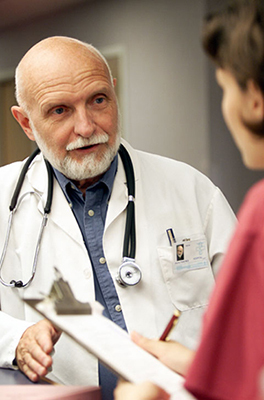 Levindale has physicians, physician assistants and nurse practitioners on staff. In addition, there are more than 100 attending and consulting physicians credentialed at Levindale who together provide 24/7 in-house medical coverage. Our medical team, which also includes 600 nurses and nursing assistants, is second to none when it comes to ensuring continuous care for our residents and patients. To see additional services, please visit our Medical Services site. Levindale provides full-time chaplaincy of all religions. However, Levindale is a Jewish center, and Jewish celebrations, observances of Jewish holidays and customs, and Jewish laws are followed. Levindale has adopted the Eden Alternative and Neighborhood Model, which implements homelike living spaces and "neighborhood" amenities, such as a synagogue, boutique and museum, to create a sense of community for all residents. Nursing home units are designed as "neighborhoods," and all Levindale employees are trained in "person-first" techniques, which emphasize the individual needs of residents. Easing the physical and emotional pain of residents and patients is extremely important at Levindale. Our Comfort and Hospice Care program was especially designed to fulfill the wishes of people who are in pain, who are chronically ill or at the end of their lives. The Centers for Medicare and Medicaid Services (CMS) requires all hospitals make available pricing information related to hospitals services through its internet website. The file posted here, commonly referred to as the “chargemaster”, reflect charges for items and services provided by Levindale Hospital. In Maryland, the rates charged by hospitals are established and regulated by the Maryland Health Services Cost Review Commission (HSCRC), a state regulatory agency. The hospital charges do not include charges for physician services, which are separate from the hospital bill. Charges on individual hospital bills may be different from those posted here, as the HSCRC allows for a defined level of fluctuation to occur throughout the course of a year. Levindale Hospital will post its chargemaster two times a year in coordination with the approval of hospital rates by the Maryland HSCRC. Please click on the item below to download.